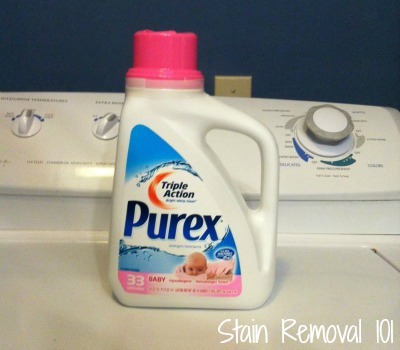 Sarah shared her Purex baby laundry detergent review. I've been using the baby Purex for the last 3 years for my now 3 year old. She's never had an allergic reaction to it even though there is a light scent to the detergent. I actually really like the smell and as a military wife I've had the luxury of finding it in my commissaries for less than $3.00! This deal has saved me so much money as compared to buying Dreft once before finding baby Purex. This particular detergent has it's own distinct scent which is very hard to describe but it smells good to me :) Hope this helps! Thanks for sharing this review with me Sarah. I would love to hear from even more people who've used this detergent formulated for babies, telling me what you think about it. You can share your Purex review here, or read other reviews of other varieties that have already been submitted. In addition, you can learn more about other baby detergents here. 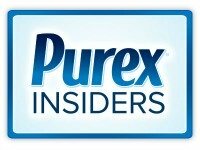 I was recently provided with a free bottle of Baby Purex detergent from the company, since I am a Purex Insider. I have now done several loads with this detergent, washing all of family's clothes with it to see what I thought of it. As I noted, however, when doing a review of the major brand survey of baby laundry products this brand does contain a light scent, even though it claims to be hypoallergenic. I personally don't think of anything scented as being hypoallergenic. Instead, to keep from bothering allergies I believe such products should be both scent and dye free. We don't normally use scented products, so I was concerned to try it on my children's clothes, since my son has laundry allergies. But, it has not bothered anyone in the family to have this light scent. Someone described it as smelling like baby powder, but I don't really think of the scent that way, although I cannot really describe it. It is a light scent and does smell "babyish" though, so if you like something scented but not overpowering this may be something you like. 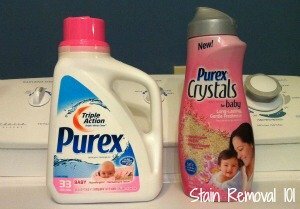 I recently also received a bottle of Baby Purex fabric softener crystals (as you can see on the left), which I have yet to try, but will be using with the baby detergent to see how the two scents combine and what I think of these products together. I will post a link to that review here once I've written it. Basically, my bottom line of this detergent is that I probably won't buy it again, just because I prefer soaps without scent. However, I will use the entire bottle and not waste any of it since even with scent it doesn't seem to bother my family's allergies. I'd love to hear from even more people who've used this or any other Purex laundry product. You can share your Purex reviews and experiences here, or read others that have already been submitted. 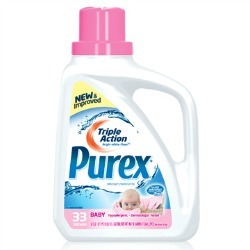 FTC disclosure: Purex provided me with a bottle of this detergent in exchange for a product review. However, all the opinions expressed here are my own. Just as good as the more expensive baby detergent. Works great. We all have sensitive skin. I use it on adult clothes too. This is a fraction of the price of Ivory Snow. I find it works just as well!! I got dreft as a gift at my baby shower and it smells like spit up so I bought the purex baby because it was cheap. I fell in love with the smell and it removes stains just as well as dreft. For baby food stains you need to pretreat with a stain remover but I'm doubting any detergent can get those out alone. I don't have babies anymore I can wash my laundry in it just as well as any kind. There is no scent left after you pour it in the washer, the scent is moot as it is very light. Once you take your clothes out of the washer they have no scent. Not good on tough stains or heavily soiled laundry and you'd think it would be designed to clean very well but it's okay for towels, sheets and lightly soiled items. It's just a mild clear detergent and some people might find it is what they want.